Description: the fifth (and final) FH227 airframe for Delta Air Transport was delivered at Antwerp airport on May 30 1981, still registered "N854TA" of the lessor in basic colors of previous operator "Transadria Airways" and is depicted such. Description: on July 2 1981, it came in the Belgian register and went operational from July 19 onwards and was the first aircraft wearing their new corporate identity. 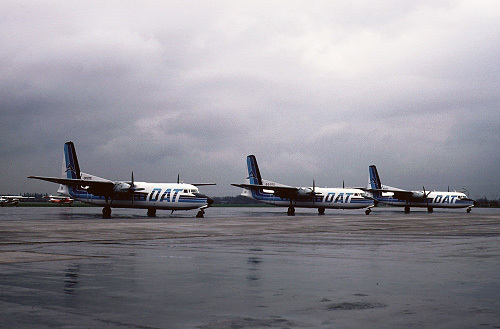 Description: nice line-up of three Fairchilds in typical Belgian weather with from left to right: OO-DTE, OO-DTD and OO-DTA. Description: second and final color scheme, adopted on November 21 1987, in anticipation of a name change "DAT" which did occur in 1988. 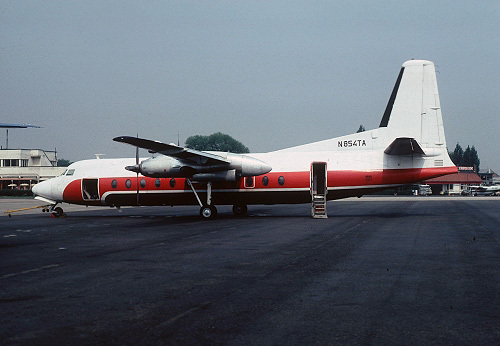 This airframe was operational till March 1990 and when cancelled to Nigeria as "5N-ATL", it was their last FH227 to leave the once five strong fleet.